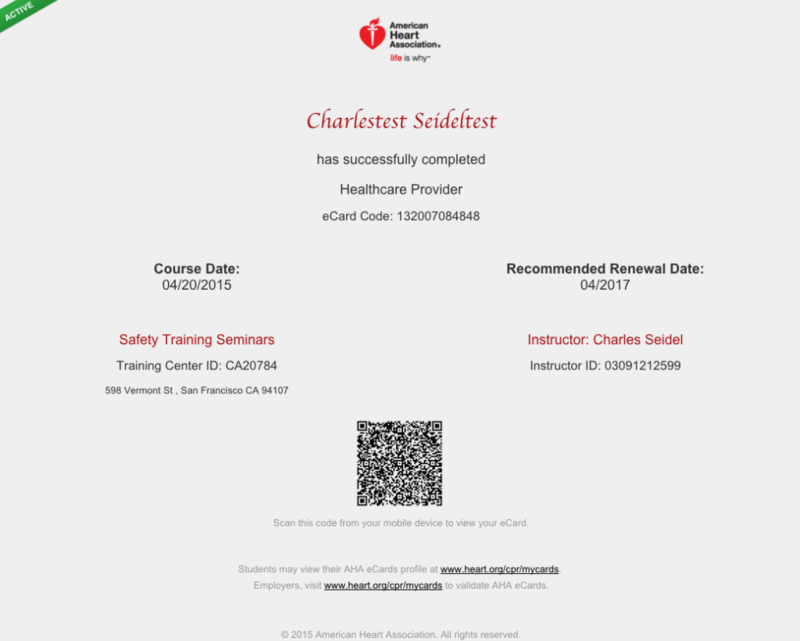 The American Heart Association has developed a new method of issuing their ACLS, PALS, BLS, and CPR certification cards called the eCard. What is an eCard? An eCard is the electronic equivalent of a printed course completion card and can be provided to students as proof of their certification. The new eCards are valid course completion cards and can be presented to employers as proof of successful completion of an AHA course. Why is the AHA now offering eCards? The eCards have been designed based on many years of insight from the AHA Training Network and they are more secure than printed cards. Regular printed cards can result in security risks and counterfeit cards. The new eCards make the job of issuing course completion cards simple and secure, helping to mitigate risks that can accompany issuance of paper cards. What are the benefits of using the new eCards * Higher security and reduced risk of fraudulent cards. * Environmentally friendly – Students can easily forward their card to a supervisor by email. * Ability to validate an eCard through the AHA website. * Student will no longer have to pay $30 fee if they lose their card. * Students will receive their card in 1 business day or sooner. Why does the eCard say the name of the class is Healthcare Provider instead of BLS for Healthcare Provider? The official name of the class is Healthcare Provider. The longer name of the course is Basic Life Support for the Healthcare Provider. I did not receive my eCard. What should I do? 1. Check your email or spam folder for an email from: ahainstructornetwork@heart.org 2. Follow the directions to view your card. 3. If still cannot view, call us at 415-437-1600.